UDM Downloads > Print Maestro! PrintMaestro - for print the folders tree and folders content easily. Print and export your folders context to pdf or html files. With Print Maestro you can navigate the hard disk and print or export the list of files to various formats... all done by an intuitive, graphical, view and click interface. 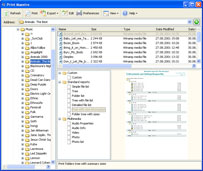 Using Print Maestro you can easily print: - a simple file list; - the Folder (Directory) Tree; - the Folder (Directory) List; - the Folder Tree with the file list; - a detailed list with file attributes; - the Folder Tree with size information - list fo films (with fields like size, Duration, Width, Height, Codec, Aspect Ratio) - list of photos (with fields like Create date, Orientation, Exposure time, Width, Height) - list of songs (you can use Artist, Title, Album, Comment, tags or BitRate, Sample Rate, Channels, Duration tags) - file version info report (Company Name, Version Info, Copyright, Product version) - your own report with any EXIF fields We do create examples on demand! Do not hesitate to contact us if you want to use our component for the tasks that do not have examples yet. We will do our best to help you out!